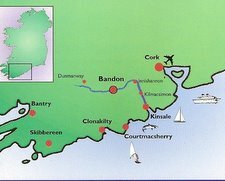 Welcome to the genealogy site of the town and surrounding area of Bandon, Co Cork. This site is being put together to help those researching their roots specifically in and around Bandon. We are always happy to receive contributions of historical or genealogical interest for the Bandon area. Please email us at bandon.genealogy@gmail.com with any suggestions or additions that you may have. 1st May, 2018 - 30th September, 2018 10am to 5pm.To view church records at the centre, please contact John Hurley to arrange a day and time as this centre is manned by volunteers & may not always be open during the advertised hours. Please note that we are not part of this centre so you will need to contact John directly. Our latest publication entitled 'The Sealy, Cornwall and Allin Families of County Cork: Merchants and Bandon Gentry' is now available on Amazon. The chapter titles and index are listed on this site. 'Bandon, County Cork. A Social History of North Main Street and Kilbrogan Hill' is a directory of the houses on North Main Street & Kilbrogan Hill. Well known Bandon families such as the Bennetts, Tresilians, Cornwalls, Teulons, Baldwins and Hornibrooks lived for a time on the street and we have done our best to identify the exact houses where they lived and/or held leases. Available on Amazon. Our first publication was The Tresilian Family of County Cork - Landowners and Bandon Merchants. The Tresilians married into well known Bandon families such as the Pophams, Sullivans, Allmans, Belchers, Bernards, Seymours, Jenkins and Jagoes. Available on Amazon. A recent publication entitled 'Murragh - A Place of Graves' provides a very detailed analysis of the graveyard and families buried there.